June 22, 2011 - US Airways, the largest operator of the Airbus A320 family of aircraft has signed a memorandum of understanding to upgrade its fleet of V2500-powered Airbus A320 family aircraft with the recently unveiled V2500 SelectTwo fuel burn improvement package from International Aero Engines. As part of this agreement, US Airways would purchase kits to upgrade 92 aircraft in its fleet and to convert 60 aircraft on order to the newest engine configuration prior to aircraft delivery. The A320 series has two variants, the A320-100 and A320-200. Only 21 A320-100s were ever produced; these aircraft, the first to be manufactured, were delivered only to Air Inter (later acquired by Air France) and British Airways (as a result of an order from British Caledonian Airways made prior to its acquisition by British Airways). The A320-200 features wingtip fences and increased fuel capacity over the A320-100, resulting in increased range; otherwise differences are minimal. Typical range with 150 passengers for the A320-200 is about 3,300 nautical miles. It is powered by two CFMI CFM56-5s or IAE V2500s with thrust ratings between 113 to 120 kN (25,400 to 27,000 lbf). The direct Boeing competitor is the 737?800. "Since the start of our relationship more than two decades ago, US Airways and IAE have benefited through our collaborative cultures," said Ian Aitken, president and chief executive officer of IAE. "To have US Airways retrofit its V2500 fleet with the SelectTwo demonstrates the value of the upgrade package and once again proves our philosophy of continuous improvement." The IAE V2500 is a two-shaft high-bypass turbofan engine which powers the Airbus A320 family (A320, A321, A319 and the Airbus Corporate Jet), and the McDonnell Douglas MD-90. International Aero Engines is a consortium backed by four aero-engine manufacturers, formed in 1983 to produce the engine. FAA flight certification for the V2500 was granted in 1988. IAE's long relationship with US Airways began with America West Airlines, which placed three V2500 powered Airbus A320 aircraft into service in February 1991. "US Airways has been proud to partner of International Aero Engines for more than 20 years and is pleased to be acquiring this environmentally friendly and fuel-efficient enhancement to V2500 engines, which is installed on many of our narrow body Airbus fleet," said US Airways' Chief Operating Officer, Robert Isom. "IAE is an important business partner that is customer focused and has executed a strategy of consistently upgrading the capabilities of V2500 engines to provide us with the most efficient powerplant possible." US Airways currently has a fleet of 106 aircraft powered by V2500 engines, including 39 A319s; 49 A320s, and 18 A321s. A US Airways engine holds a time on wing record for the V2500, completing 30,520 flying hours on its first run. 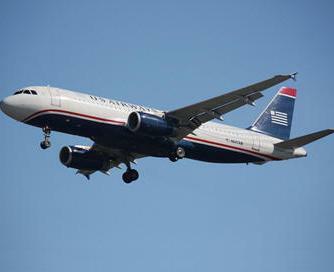 US Airways, along with US Airways Shuttle and US Airways Express, operates more than 3,300 flights per day and serves more than 200 communities in the U.S., Canada, Mexico, Europe, the Middle East, the Caribbean, Central and South America. IAE is a multinational aero engine consortium whose shareholders include Pratt & Whitney Rolls-Royce, Japanese Aero Engines Corporation and MTU Aero Engines. Presently, there are more than 5,500 V2500 engines in service or on firm order with nearly 200 customers around the world.